As Xi Jinping Takes Top Post In China, Hopes Of Reform Fade : The Two-Way He was elected general secretary of the Communist Party of China early Thursday morning. But those hoping for change in China say the make-up of the party's elite makes it unlikely major reforms will come anytime soon. Chinese leader Xi Jinping earlier today in Beijing. 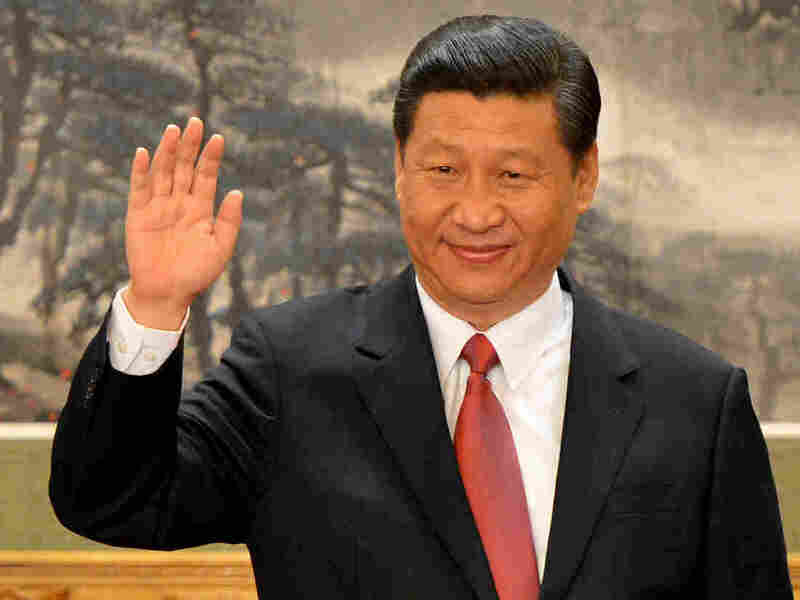 Though new Chinese leader Xi Jinping "didn't once mention Marxism or Mao Zedong" today as he stepped into his new role, the make-up of the "gang of seven" that he now heads "will disappoint those hoping for sweeping reform," NPR's Louisa Lim reports from Beijing. "The possibility of reform is now an illusion," historian Zhang Lifan tells her. "Judging from personnel appointments and amendments to the party constitution, hopes of reform are very remote. ... It's really like the Soviet Union before its collapse. Some reformist officials are blocked from being promoted. By the time they get to a position where they can effect reform, the whole situation will be different." Among those stepping into top posts: Zhang Gaoli, who will be directing economic policy. On Morning Edition, Louisa said he embodies "the old school of borrow-and-build, what some might call 'the China bubble.' "
Still, Xi did at least nod toward one of China's greatest challenges. "The problems among our party cadres and members of corruption, taking bribes, being out of touch with the people, undue emphasis on formalities and [bureaucracy] must be addressed with great efforts." he declared. Our original post: "Xi Jinping Secures Top Chinese Leadership Position." Xi Jinping, who as a young man lived for seven years in a cave, has become China's new leader. "Xi Jinping was elected general secretary of the Communist Party of China (CPC) Central Committee at the first plenary session of the 18th CPC Central Committee on Thursday morning. Other members of the newly elected Standing Committee of the Political Bureau of the 18th CPC Central Committee are Li Keqiang, Zhang Dejiang, Yu Zhengsheng, Liu Yunshan, Wang Qishan, and Zhang Gaoli." Xi takes over the leadership of the Communist Party from Hu Jintao. The Associated Press reports that he's expected to assume the presidency in March 2013. NPR's Louisa Lim reports Xi said the leadership committee would "fight for people's desire for a better life." He listed the party's pressing problems, including corruption, bribe-taking, and party members being out of touch with the people. But the new committee is likely to disappoint those hoping for sweeping political and economic change. In other news, China's President Hu Jintao stepped down as army head. This came as something of a surprise to analysts, who believed he might try to stay on for an extra two years. But that will give Xi more power over the army, strengthening his overall position. "Just 15 at the time, Xi Jinping was sent by his family in Beijing to the remote rural village Liangjiahe in the hills of Shaanxi Province, hundreds of miles away, where for seven years he lived in a cave scooped out of the yellow loess hillsides. He arrived there in 1968, after his father, a revolutionary fighter and former vice premier, had fallen from political favor." Louisa also reported about Li's soft spot for the town of Muscatine, Iowa, which he first visited 27 years ago as a young government official. "'Coming here is really like coming back home,' Xi told his old Iowa friends, according to Sarah Lande, who hosted him in February and organized his earlier trip in the 1980s. An Iowa newspaper offered Xi a full-page welcome: 'Feels like home,' read the headline, superimposed on a picture of an Iowan cornfield, with Xi's portrait." Xi's rise to the top Chinese leadership position comes despite a year that's seen a corruption scandal that saw the downfall and subsequent ouster of populist leader Bo Xilai.